Tonight begins the third Mercury retrograde period of 2016. It entered its shadow on August 10, and entered into retrograde tonight on August 30; it will pause again to go direct on September 22, and will be back to its proper speed on October 6. All this happens within its own domicile sign of Virgo. The next time Mercury goes retrograde is after entering into its shadow on December 1, then hitting its retrograde station on December 19, going direct again on January 8, 2017, and getting out of its shadow on January 27; this begins when Mercury is in Capricorn, and ends when Mercury is back in Sagittarius. As many of my readers already know, when a planet goes into retrograde motion, the things associated with that planet tend to go backwards, awry, or wonky in some way. Given that Mercury governs all things associated with travel, commuting, divination, communication, study, memory, speech, trade, technology, and planning, expect difficulties, delays, repeats, and do-overs aplenty during this time. Because this specific Mercury retrograde period is all within the mercurial sign of Virgo, expect this to be a double whammy for many people. It’s not all that bad; for most people, you just need to do your three-point tap before you leave the house, leave ample time to get to work, and always read through any and all documentation twice before making a decision and you’ll be fine. For Hermetic magicians and those who work closely with Hermes, or for those who have Mercury as a particular strong planet in their natal horoscope, you may want to step more carefully, given our strong connections to this kind of energy. Take this time to review your life, trace your steps, and reflect on all the things that compose you and your life before the retrograde period is over; use this time well, and don’t freak out about it. Gave thee forever flowing souls to guide. And grant our mystic works a happy end. For the libation, instead of my usual wine mixed with olive oil, I only offer clean, pure water, and that only after thoroughly cleaning and polishing out his offering vessel. Normally, I’d give it a good rinse to get any of the remains from the previous offering and wipe out any remaining residue, but I take this opportunity to thoroughly clean and polish the whole thing until it shines like new. Similarly, I also remove all old offerings and clean his shrine. Additionally, and most distinctly, I wrap my image of Hermes in a black shroud, so that the entire body and form is occluded. The shroud remains until the planet leaves retrograde, at which point I remove the shroud and make the usual offerings of wine and ouranic prayer. Between these two dates, however, I make no further offerings or direct interaction with the god. 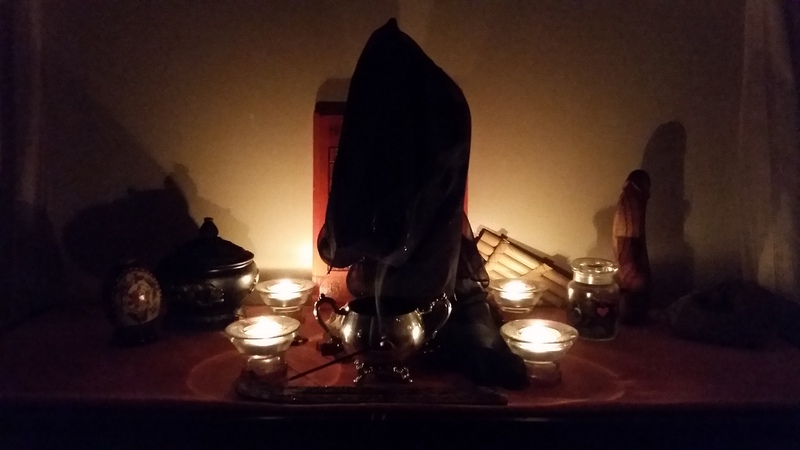 Why the unusual ritual offering of water, chthonic prayers, and the shroud? This is all because Mercury goes into retrograde. In a sense, this is the unusual time where Hermes is a little more trickstery, a little more baneful than at other times, and…honestly, while it’s not a bad thing, I don’t want that influence in my life more than is absolutely necessary. To that end, I cover Hermes in a shroud to insulate him from the outside world so that he can focus on his own work, and in a way, insulate me from him so that I’m not affected by his backwards-looking gaze. This ritual period is where I work with Hermes in an apotropaic manner only, turning away the difficulties posed by Mercury retrograde and keeping me insulated and blocked off from them. For a similar reason, I only offer water that is clean and pure, rather than dark wine. I want to give Hermes that which is clean and clear so that I can obtain the same, keeping my eyes and my ears clean and clear from confusion, my path and my travels from obstacles, my mind and my heart from illusion, my hands and my feet from difficulty. Offering only water to clean the ways helps me and helps Hermes to help me keep my life open and free during the retrograde; wine would obscure it in too dark a way during too dark a time, oil beslickens it in too unpredictable a way during too unpredictable a time. To me and for my work with the god, when Mercury goes retrograde, Hermes stops flying across the skies and seas and travels primarily between our world and the underworld. Previously, Hermes instructed me to only recite his chthonic hymn during nighttime, while the ouranic one could be done at any time; during retrograde periods, if I ever feel a need to use a hymn, it will only ever be the chthonic one. When a planet goes retrograde, it is only an apparent illusion that the planet goes backwards through the skies and the stars. In reality, due to the mechanics of our heliocentric solar system, retrograde periods are caused when the planet in question is closest to our own planet. In a sense, that’s what causes all these weird happenings involving the things that planet governs; rather than being at a healthy objective distance for us to interact with, the energies of that planet suddenly become too close for comfort, hidden right under our nose, and befuddled all up in our mind as subjective rather than objective and distant. Mercury is no exception, and in fact is the poster child for retrograde energies, even if only because it’s the planet that goes into retrograde motion the most often. It’s the time when all these energies and influences turn inward instead of outward, which would be fine if we didn’t have all these pesky civilized things we have to deal with on a day-to-day basis, like jobs and commuting and business and whatnot. Rather than posting melodramatic memes on Facebook fuming about Mercury retrograde, I try to go with the flow, respecting it and accepting it in a way that helps me deal with the resulting chaos, and changing my habits and works accordingly. So, for someone like me who’s so entrenched in mercurial energies in both the religious sense (priest of Hermes), the magical sense (Hermetic magician), and the career sense (software engineer), and for someone whose own natal Mercury is already retrograde and dignified, what’s the best way for me to spend this retrograde period? For that matter, what’s the best way we can all spend this time? Mercury, the planet of thought and memory and learning, is going backwards, so it behooves us all to go backwards in the same way: spend this month in a time of reflection, reminding, recollection, and remembrance. Think of your whole life and how you got here, even to the physical place you are. Think of all the people, from teachers and parents to friends and enemies, who had even the smallest influence on your character. Think of all the lessons you’ve learned, sitting down at a desk or running around in your life, which helped shape how you think and how you act. Think of all your ancestors, from those who passed away in your lifetime to the countless generations back before you, who lived and fought and rejoiced and died so that you too can share in this incarnation of flesh and blood and breath and bone. Reflect on yourself, and see who you are both inside and out. Remind yourself, and re-mind yourself. Recollect yourself, and re-collect yourself. Remember yourself, and re-member yourself. By these, you will come to know yourself, and that’s really the whole goal here for any of us, isn’t it? For myself…gods, how did I get here? Back in middle school, I dabbled with my brother’s hand-me-downs from his short voyage into neopaganism, and learned the basics of divination from my Tarot-reading sister. In high school, I kept alive a healthy imagination for new worlds and poetry and the power of the written word in personal journals to explore my own internal landscape. In college, I began my studies of geomancy and medieval astrology, and started this blog on Blogspot as a devotional for XaTuring, the Great Worm of the Internet. I met so many people, so few of whom I have in my life anymore because I was only barely developing a social life after intense bullying in elementary school, and I recently turned down the invitation for my high school’s ten-year reunion because screw those people and the awkwardness and the lack of connections I never care to suffer through again. I dated and fucked up and made it better and repeated the process so many times, and showed me my own capabilities, my own culpabilities, and my own tendencies to virtue and to vice. After college, I pined and loathed and laughed and fucked around and fucked with others and fucked others and been fucked by others. I began my own Great Work, and built up my own geomantic practice and social presence both online and offline. I developed my own style of working under Fr. Rufus Opus, and met people of varying paths both light and dark, both right-handed and left-handed, both brilliantly alive and gloriously dead. I met the love of my life through magic on both our ends, and we began to build ourselves together, only to get cut down together by misplaced trust and found it again with allies and colleagues. We married, on accident for us and by divine provenance from the gods. We bought a house. I changed jobs to one that I was encouraged by multiple spirits to take, only to suffer and discover my own limits but which allowed me the means to grow privately even more. I changed jobs back once more, solidifying my career path into one that I am fundamentally comfortable and safe within among colleagues and coworkers I know and trust and love. I have gone from having neither shrines nor altars to one, then two, then four, all the way to having a house full of them and beginning what is truly a temple to recognize all the powers, and moreover, all our powers and deities. I have gone from having a journal to a notebook to a blog to several ebooks and a full book on the way. I have gone from school to college to federal job, within each from hell to heaven and back and again. I have gone from single to committed to broken down to broken up and back again, and now to marriage and partnership on all levels of human existence. I have gone from having friends to enemies, and enemies to friends. I have gone from one computer to the next, one operating system to the next, shifting data and programs around and finding new and better ways to do what I need to do. I have gone from no debt to student debt to low debt to car debt to credit debt to mortgage. I have gone from hair to skinhead and back. I have gone from pristine to consecrated tattoos, from whole to pierced to whole again. I have gone from spiritually fearful to excited to exasperated, both towards people and to spirit alike. I have gone from repulsed by even the notion of rot to almost enjoying the smell as it passes by me in the forest or in the basement. I have gone from despising emotion to recognizing it to manifesting it to using it and being used by it. I have gone from one place to another in every way and in every sense. Just as all motion is change, then truly, in so many ways, as I have gone, so have I changed. And yet, underlying all that, there’s so much that has never changed. I still hunger, like a crazed man starved for years, for knowledge and power and glory and wisdom. I still rejoice with friends around me. I still love, and I still love to create and to build and to fortify and to defend. I still make mistakes. I still make successes. I still write, privately for myself and publicly for others, sometimes for free and sometimes for pay. I still code and woodburn and bead and craft and cook. I still love the wind through my hair and the rain on my palms. No matter how much I change from past-me to present-me, I am still me. I still move with the world, and that when I move the world, the world moves me. No matter how much I move, I am still. Just as all motion is change, then truly, in so many ways, as I have remained still, so have I remained the same. I see my hands, and how they have maintained the same bone structure, and yet have grown and have touched and used so many things. I see my eyes, and how the irises still have their intricate patterns, and yet gleam differently than they ever did, both brighter and dimmer than ever before. I see my body, and how the flesh is still recognizably mine, and yet have so many scars and additions and subtractions. By remembering all the things I have done, I re-member myself, and make my body whole from parts. By reflecting my emotions I have felt, I re-flex myself, and make my soul whole from parts. By recollecting all the things I have said, I re-collect myself, and make my spirit whole from parts. By reminding all my thoughts I have thought, I re-mind myself, and make my mind whole from parts. And, in doing so, by remembering and reflecting and recollecting and reminding, I am become a sum of the parts, and become a whole, and become greater than the sum of the parts. There is no one thing of, in, or about me that is me, and yet it all comes together to make me. Retrogression is for retrospection; we go backwards to look backwards. Use this time well; as Hermes descends among us and below us, he goes to find the lost and bring them to their proper place. Whether these are lost items, lost tasks, lost souls, or lost goals, it serves us well to go back and find ourselves in this chaos so that we can once more bring order to ourselves and, thus, to our worlds. This is not a time for tools, except for the pen and paper in the study; this is not a time for communication, except for our own thoughts echoing in our heads; this is not a time for action, except for acting within ourselves in our own internal spaces; this is not a time for learning, except to relearn what we already forgot. Turn back, dear reader, not for fear for your life to stop, but for faith for your life to continue.